Today started yesterday! 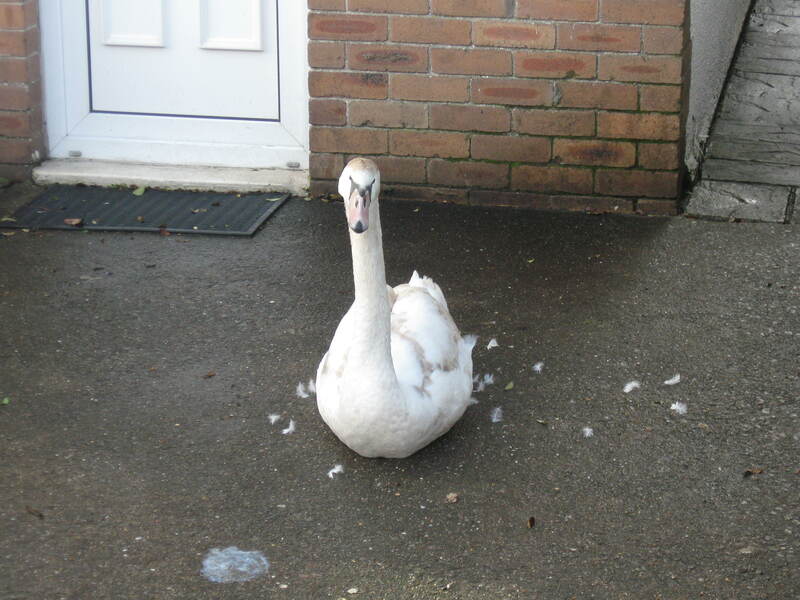 PB phoned at 2025 hours to say he had received a call from the Tesco Distribution Hub at Magor to report the fact a swan had come down in the busy lorry park, and that he had been out to collect it. I’m afraid to say I ducked out when Pat said he thought he could probably manage to accommodate the swan at ‘his’ overnight. Fantastic! What a relief! What it meant was there was then a clear need to get up and get on with it on Friday! Got to Pat’s just before 0900 hours. 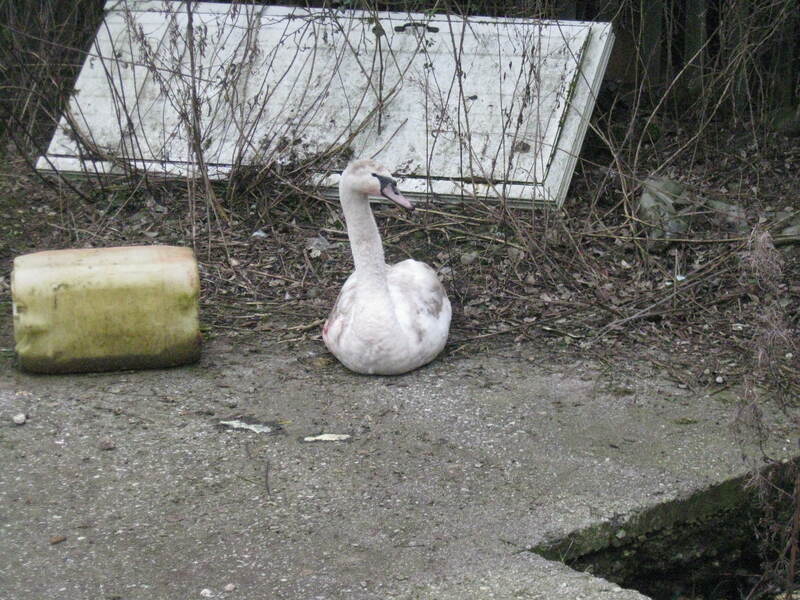 The swan – probably a two year old female – looked so comfortable cooched where Pat’s dog normally sleeps. I’m afraid I omitted to find out where the dog did spend the night…. The swan had fed well on bread and shredded cabbage in water. While there, inevitably (! ), the phone rang announcing a problem in an isolated hamlet between Bristol and Bath -Siston. 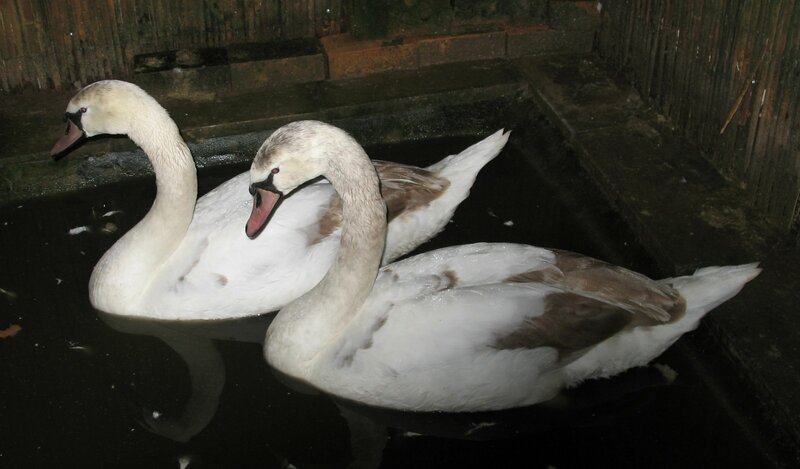 Two weeks earlier a pair of adult swans had arrived, and appeared to have established themselves on the caller’s pond. Fine. Trouble this morning; a single juvenile had arrived, and very clearly had not been made welcome. The adults set about the young bird with murderous intensity, and what should be done about it? Answer: if possible separate the warring parties, and keep them apart, and I will get there as soon as possible. Quickly take Pat’s swan, and release her at Channel View in Cardiff. M4 to Junction 21, Bristol ring-road, and so to Siston. Juvenile swan now out of sight of the adults – downstream of lake in outlet stream. Easy to catch – stream not too deep, and with a firm stony bottom. Rapid escape, and deliver juvenile to The Knap at Barry; now one of a flock of about thirty birds, four of which are 2014 juveniles. The end, said he foolishly – there’s another six hours ’til midnight! 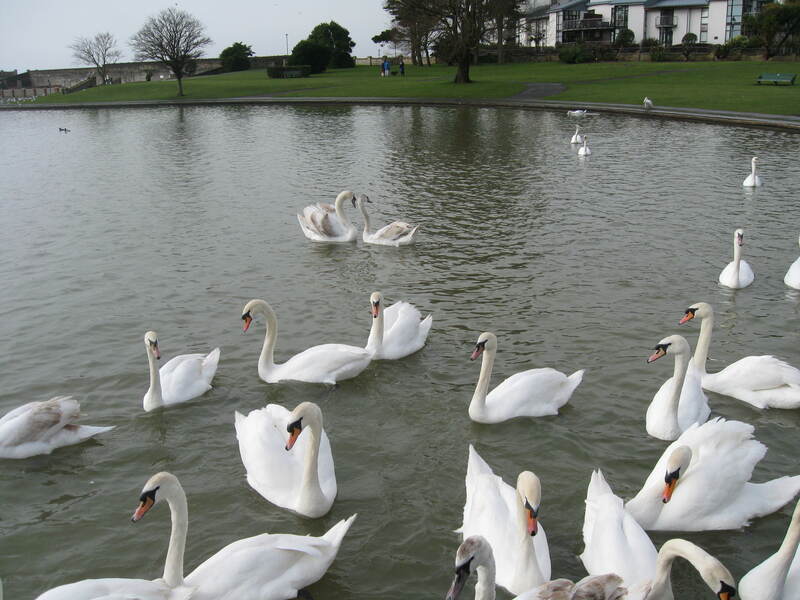 Parc Tredelerch Lake just off Lamby Way to the south of Rhymney and on the eastern edge of Cardiff has in our minds always been associated with swans becoming snared in lost or discarded fishing tackle. While the last few months has, mercifully been relatively free of this particular problem, another in our top three reasons for call-out has come very much to the fore. 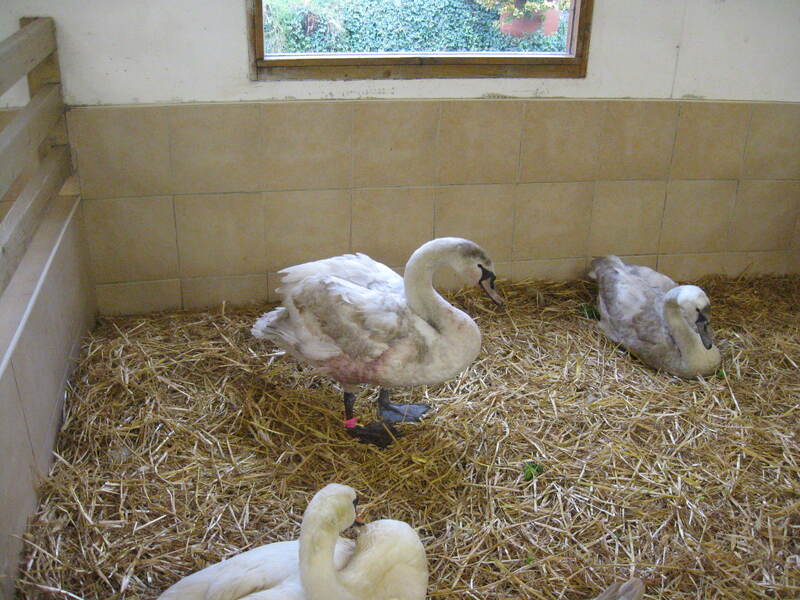 If our records are in good order, eight cygnets were hatched here in 2014, and, at the time of writing, (12/2), there are just three left, and, as we approach mid February, it really is time the others were on their way ahead of the start of the 2015 breeding season. 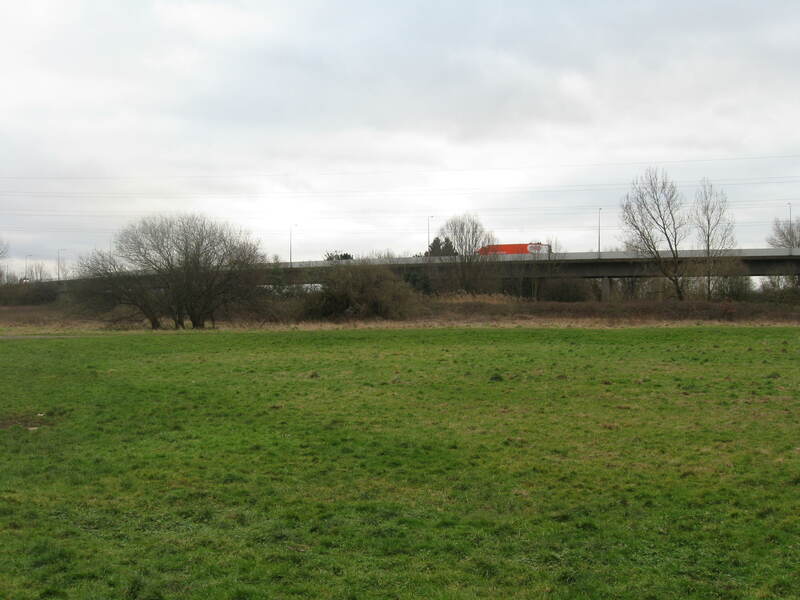 Those who are familiar with this part of Cardiff will be aware of the existence of many small industrial premises to the east and to the south, while, to the west is the flyover carrying Southern Way over the River Rhymney into Rover Way. Apart from one juvenile removed because of fishing tackle in late September, dispersal of the 2014 family started in mid-October. Maiden flights appear to have been somewhat unsuccessful, with the first two ‘grounding’ in industrial premises to the south east. The next one, sadly was even less successful. 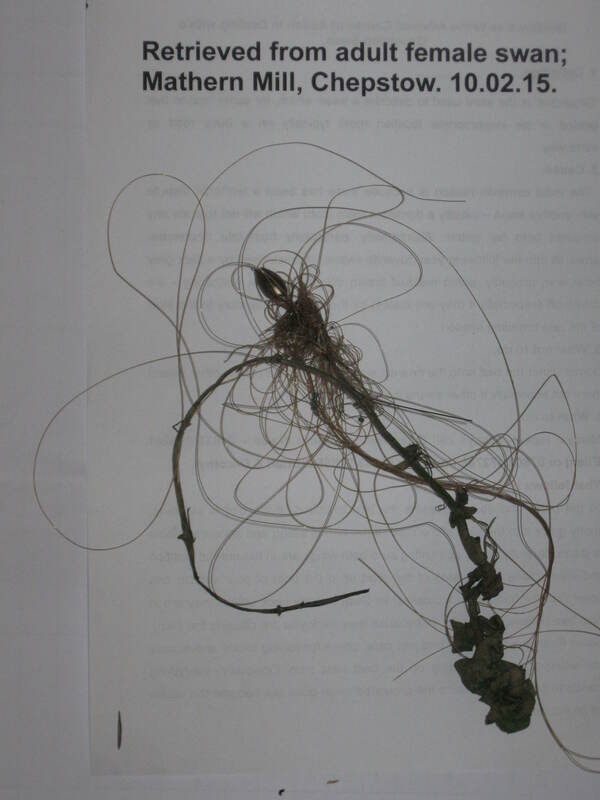 For a distance, there is a line of power cables running parallel to the flyover referred to above; the body of the bird was retrieved from a tree, having flown into these cables. That was in mid January; the swan would never have survived the double impact of hitting the cables followed by the uncontrolled fall into the tree. Finally probably at dusk on Tuesday (10/2), another juvenile crash landed into the yard of fabrication and welding engineers literally a stone’s throw from the eastern end of Tredelerch Lake, and was found there the following morning. Catching and wrapping him was simplicity itself, and, as for the decision as to what to do next – well, that was pretty simple too! National Swan Sanctuary at Shepperton. 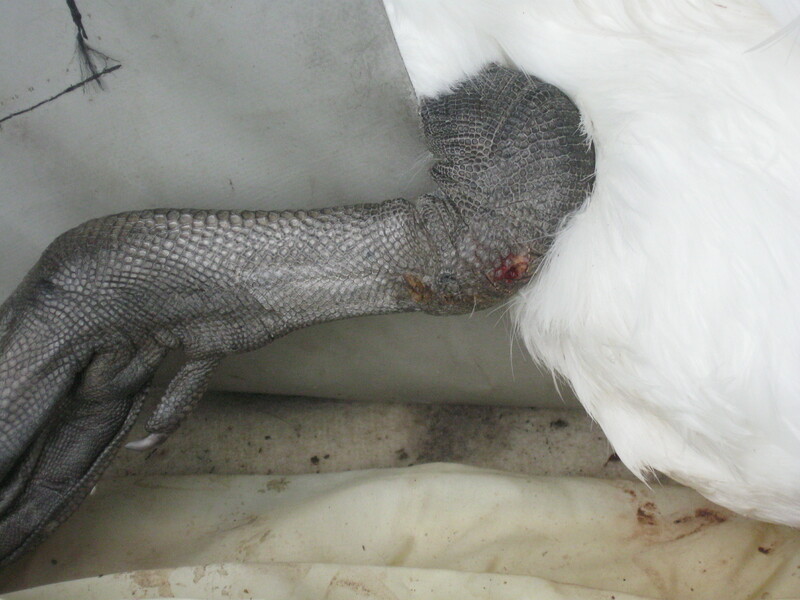 The wound under the leading edge of his left wing was fairly bloody; for the longer term, it may need to be stitched. Although we say it ourselves, we reckon that from the time we learnt of the existence of a problem until the bird was receiving the very best treatment available anywhere (three and a half hours) is not bad going, and in the certain knowledge that what had been provided really was – to coin a phrase – a ‘one stop treatment shop’ admission, assessment, treatment, aftercare, rehabilitation and release. Our last picture taken minutes before setting off for home suggests our latest casualty was at ease with the world, and really was in the best place. Its now the evening of 25th. 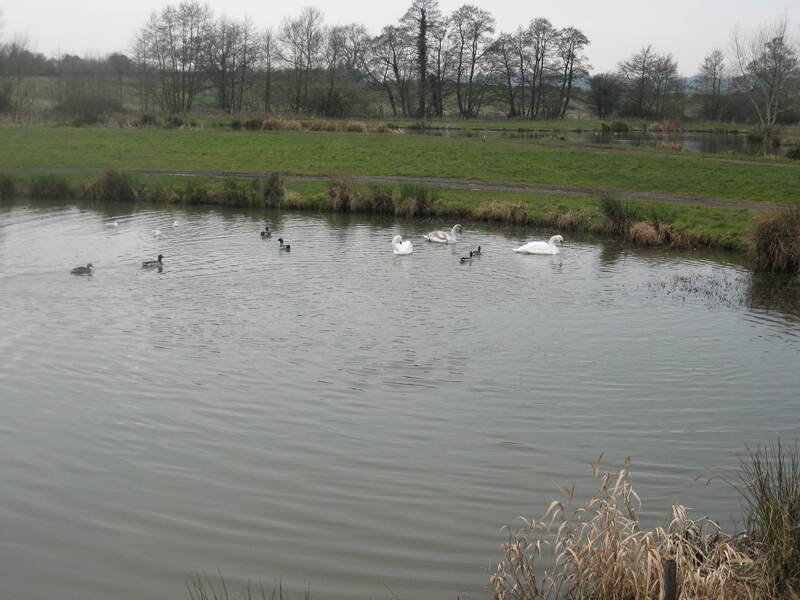 February, a day in which it looks as if the last of the young swans has finally left the lake at Tredelerch. The phone rang just before nine o’clock this morning; amazingly, it was a voice from the past – Steven had supplied and fitted a new bathroom for us about eight years ago. He was calling from an address just to the NE of the lake. What now appears to have been the last cygnet from the lake had just ‘alighted’ in the road, and it wasn’t certain whether he was hurt or not. Even for a journey apparently as short as this one, I hesitate to say I will be there in under an hour. There were patches of heavy traffic, and so, as usual it was about an hour, and then to be faced with… Notice the slightly quizzical expression – as much as to say; ‘What are you doing here?’ or ‘What took you so long?’ Catching him was easy – wrapping him up – less so; he really did not want to co-operate. 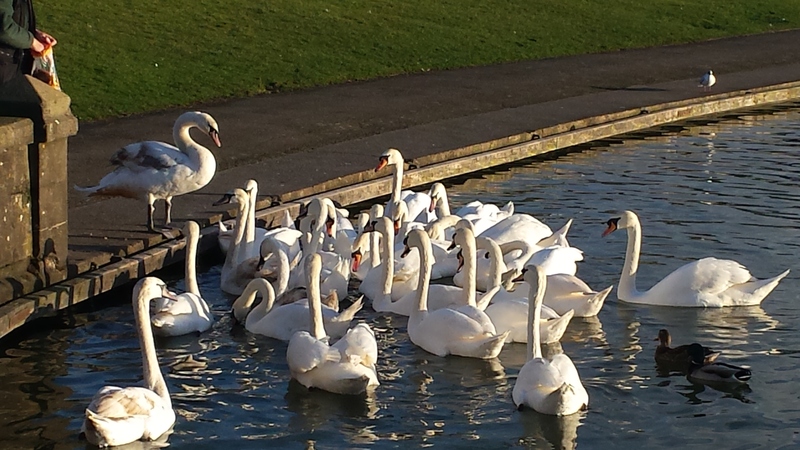 So, with 8.8kg of uninjured young swan in the back of the car, it was time to set off yet again for The Knap. In view of what had gone before, he shot out of the wrap in very great haste, and in no time at all was being greeted by one of the other juveniles; that’s the two in the middle at the back. After a most welcome cup of coffee at what is now, very definitely, a favourite watering hole, it was decided to return via Parc Tredelerch, just to be sure what was left there. There was certainly no sign any young swans, so it has to be concluded that was the last of ‘the class of ’14”, with the adults alone, and ready to start all over again. Idyllic it may seem, even although it is a cold damp afternoon in early February, but in fact it is somewhat misleading because this picture was taken after all the action had been completed. Thank goodness there are alert and concerned members of the public who are prepared to take action when they see something is wrong. 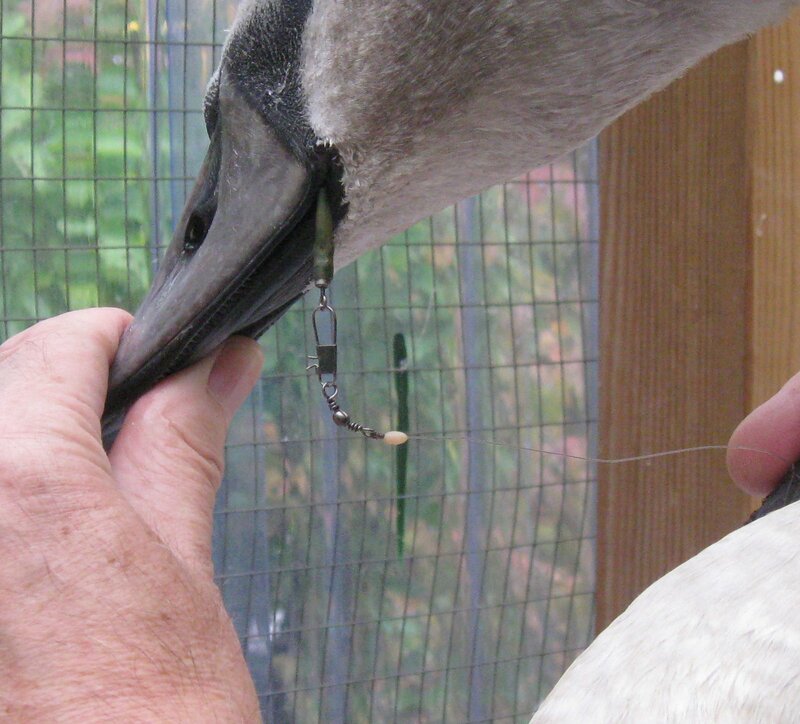 So it was, Pauline was out walking her dog at a fishery near Chepstow and spotted one of the adult swans was trailing fishing ‘wire’ from its beak. (We continue to be puzzled why so many people refer to ‘wire’ in this context – it is nylon monofilament)! 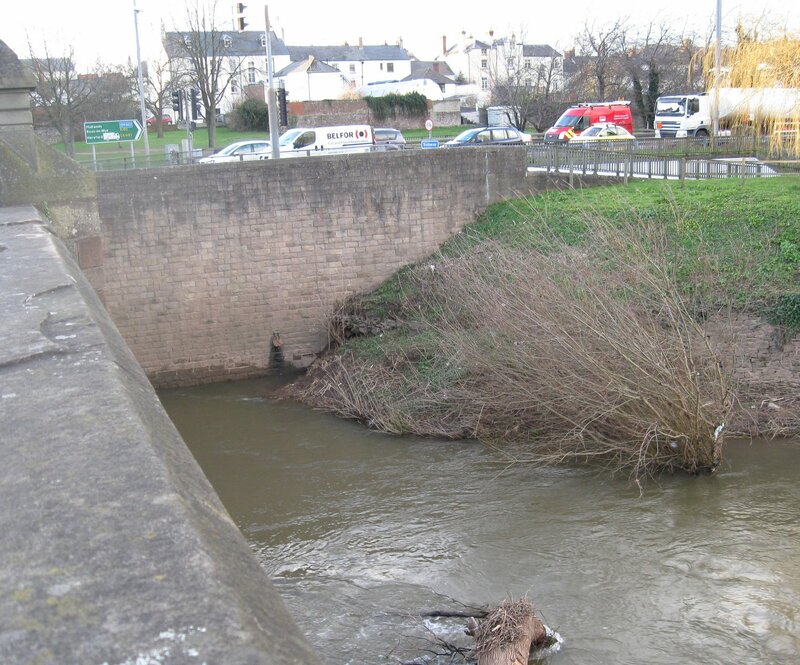 This is a location well known to us; over the years we have done quite a few angling related rescues here, and have been instrumental in getting Western Power Distribution to fit flight diverters to the ‘over-flying’ power cables – collisions with which, prior to this caused a number of bird deaths, including some swans. 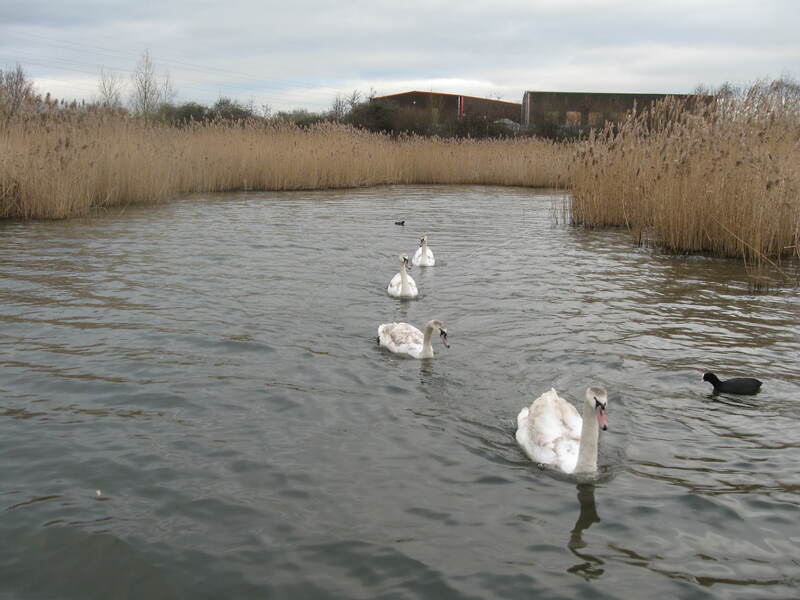 A point of interest is the fact the three swans present this day were not residents – swans did not breed here in 2014; so they must have come, most likely, either from Caldicot or St. Pierre. The nature of the problem was obvious the moment we arrived! The swan was fighting to free herself from what was a very serious encumbrance. The usual procedure, especially at this time of year when birds are likely to be hungry, and when there is a good chance they are ‘people friendly’, is to offer food – in this case grain and bread. The effect was instant! All three birds came in close, and I was kneeling sideways on, right at the water’s edge; there was a bit of a feeding frenzy, as a result of which the juvenile succeeded in getting its neck through a loop of line attached to the female. This happened at the same time as I made what I knew would be the one and only opportunity to capture the ‘tackled’ bird. 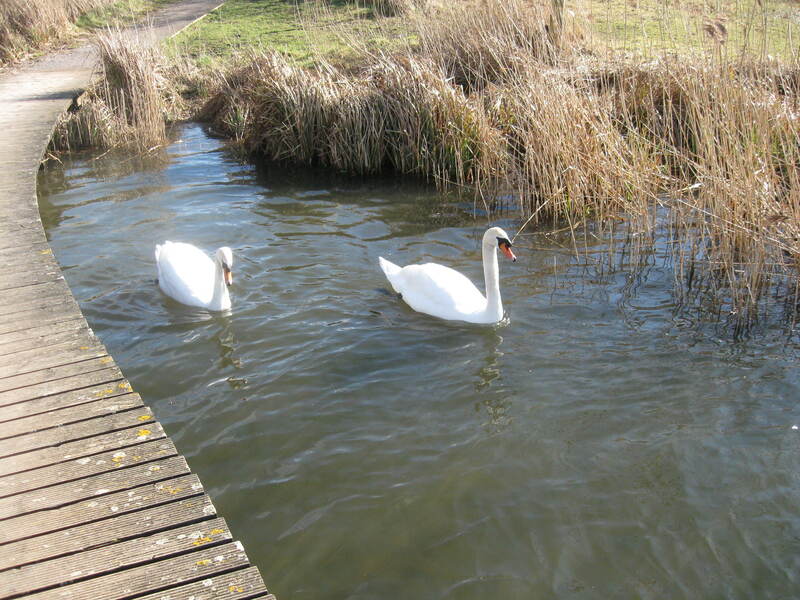 So all of a sudden, I had not one swan, but two; the female beside me on my right, and the juvenile in front me, and both wriggling furiously in an attempt to escape. Thankfully, disentangling the juvenile and letting him go was quite easy, allowing attention to be focused on the adult. Two strands of line were going down inside, and it was soon clear it was ‘fast’, and could not be withdrawn; there was no chipstrap. This left only one realistic option open – simply to cut the line, and let the bird go. And so back to our opening scene; the birds were still a little bit hungry and they did come for food, but this time, they kept a respectful distance away. Catching any of them now, even if there was good cause, would be extremely difficult if not impossible in the short term. All that remained was to let Pauline know the rescue had been completed, and to ask her to keep an eye on the one which had been snared; it was impossible to know for certain whether there had been any internal injury, but it could become apparent later if the bird went off her food or developed a lump in the neck. So, fingers crossed…. 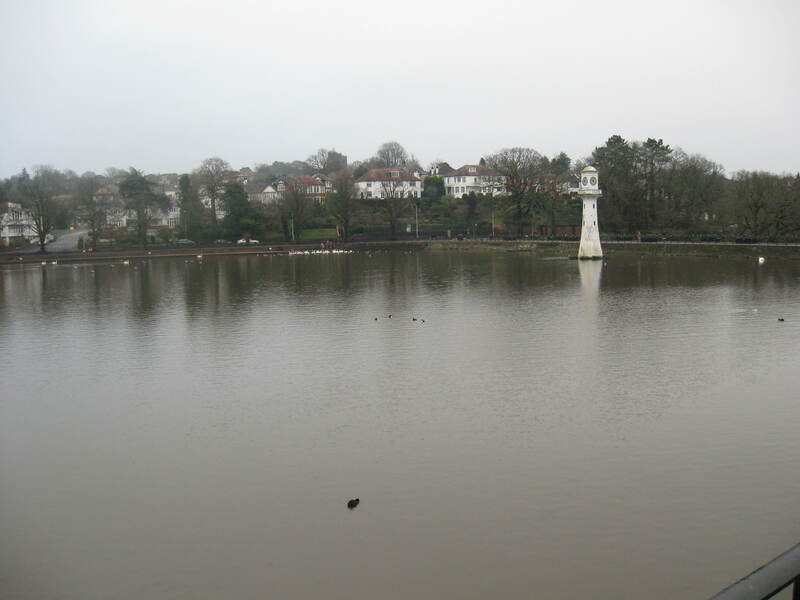 Christmas and New Year at Roath Park, Cardiff. From time to time we are asked which is the busiest time of year for us as swan rescuers. Frankly, there is no simple answer to that question. There is the surge in calls for help during the school summer holidays (and in the few weeks immediately following them) to deal with birds which have had the misfortune to pick up lost or carelessly discarded fishing tackle, and then there is the period starting in the autumn, when the young birds start to make their own way in the world – either voluntarily, or because mum, or more likely dad has decided that’s the way it should be…’Kids, its time you were off; your mum and I need to prepare ourselves for the next breeding season’. And it can be quite brutal; if, particularly a male juvenile is reluctant to leave, the result can be fatal for the young bird. For us, rescuing juveniles which have come to grief soon after leaving the home territory, seems to have gone on longer this year than is usual – and as I write – late January, it is obvious it’s not over yet. So, as we approached Christmas, we really were looking forward to a bit of a lull. 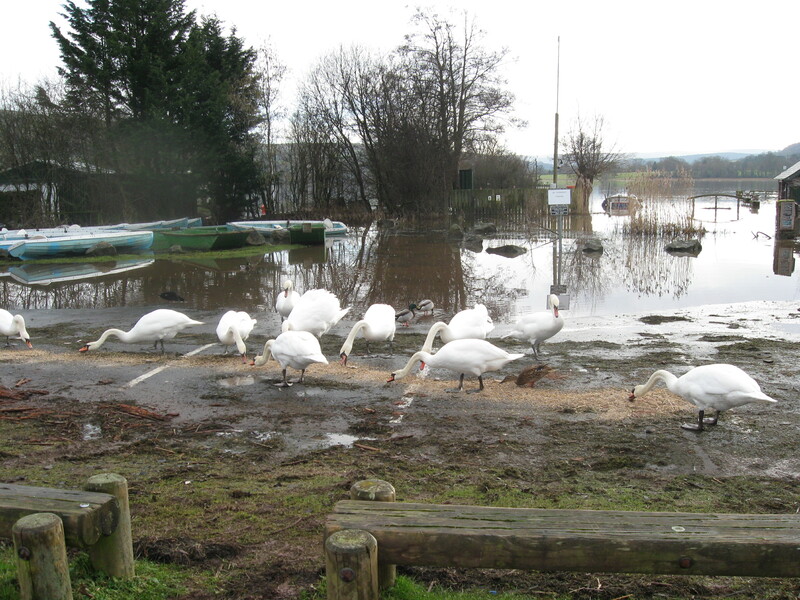 In the event, it wasn’t too bad; there was a year when, confronted with a very sick bird, there really was no choice but to head for the National Swan Sanctuary on Christmas Day. As it happened, we did get through to 28th December before the first crisis came into view. 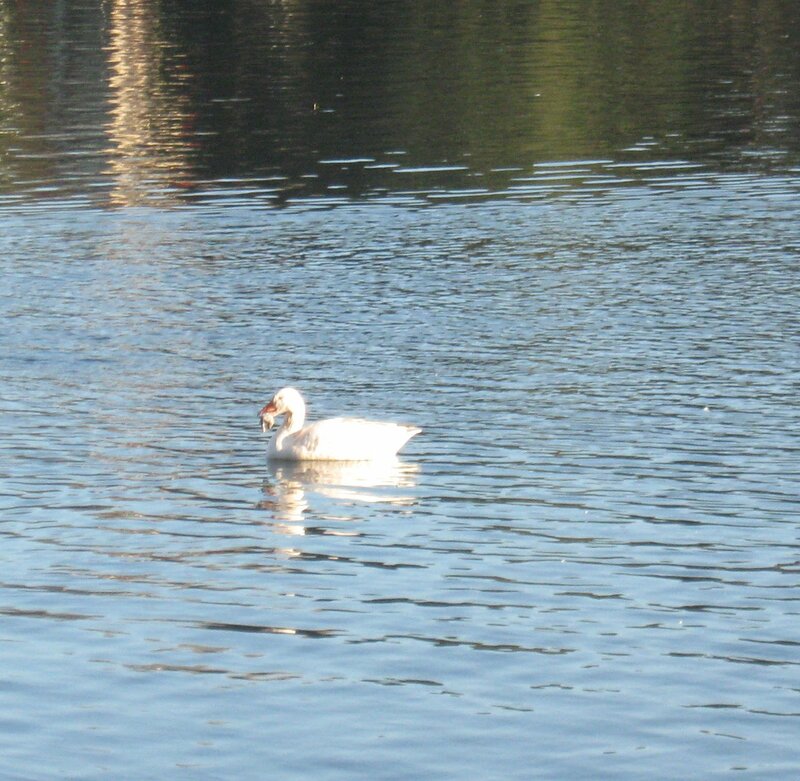 This involved a white goose at Roath Park Lake reported to have the remnant of a cola drink can stuck over the lower part of its beak. The weather was fair, so there were lots of people out walking. 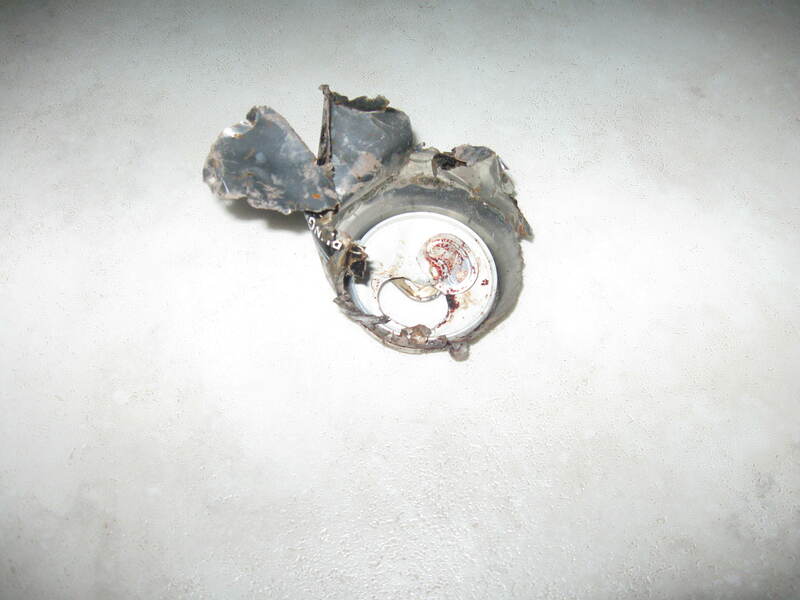 It was not surprising therefore that, over a period of five hours, we received at least 15 calls about this. What was surprising was that, despite walking slowly all the way around the lake twice, we did not see ‘our goose’. There was nothing for it, but to come back the following day. Thankfully, Monday arrived dry and fairly still; at least we didn’t have to fight the weather as well! This time, we spotted the goose quite quickly; he was a member of a ten goose flotilla which for what seemed a long time remained stubbornly some distance off-shore – just patrolling up and down the central part of the lake. Occasionally they would approach the bank as if to come out and preen, or more likely demand food. After what seemed an age, and although it seemed to be getting colder, but probably wasn’t, the group really did approach the bank with intent, and the leader clambered out. This is the time to hold one’s breath and be patient, because, as we tell anyone who is curious about what we are doing, you do get only one chance. Eventually, the whole group was on the bank, and more importantly, a reasonable distance away from the water’s edge. Now is the time to start feeding, casually slowly moving into the group in such a way as not to cause alarm, and also explaining to the growing number of onlookers the best way they can help is to do nothing. A split second decision … and its all over! 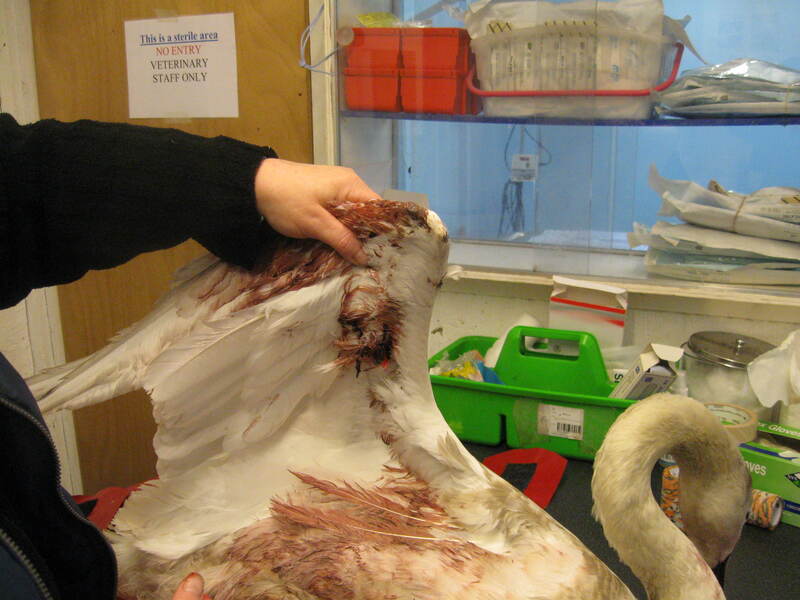 Two days later, we had a call from the rangers to collect an adult swan which was obviously very sorry for itself. It was in a collapsed state, probably resulting from coming runner-up in a territorial dispute; one wing was quite badly dropped, but fortunately, not broken. Fast forward to New Year’s Day, and this was another territorial dispute this time involving a juvenile with two dropped wings – mercifully not broken as the initial report suggested. This bird was very funny. We do like to take photographs of our casualties. In his case, as we were preparing the camera for use, he thought we were preparing to feed him. In no time at all, we was right up close ‘demanding’ to be fed! The photograph idea had to be abandoned right away, so allowing us the opportunity for one of the easiest imaginable rescues. Neither of these birds needed any surgical intervention; just peace and quiet, and rest, so the following day we took them to a sanctuary just north of Worcester, where they will get just that. The holiday period couldn’t possibly pass without fishing tackle putting in an appearance at some point; and so it was, as the light was fading on the 3rd. 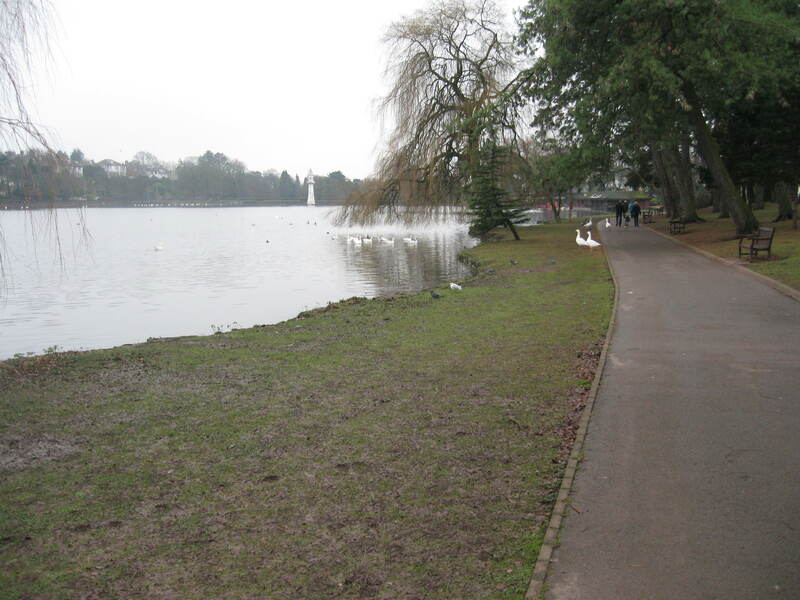 This was one of those frustrating events; two circuits of Roath Park Lake failed to confirm the presence of a tackled swan; it does happen from time to time they lose it themselves, or they swallow it, but at least there were no subsequent reports of a swan in trouble. The walk around the lake revealed the flotilla of geese with which we started this story had gained a new member, and the casualty of a week earlier appeared to be none the worse for his experience. Our Latest Visit to the Gwent Levels at Magor. Magor on the Gwent Levels is an area we visit from time to time. Specifically, it tends to be the area bounded by Whitewall and Blackwall, i.e. south of the South Wales – Paddington railway line, and which contains the Gwent Wildlife Trust Magor Reserve. It was here in late summer 2013 we rescued the entire family of swans – two adults and four cygnets which had had the misfortune to become covered in a light black and oily substance which some mindless moron had deposited in the top end of the reen which runs south from Barecroft Common about which we have already written at some length. Over the years, we’ve had the odd instance of a swan being trampled by cattle, as well as a few territorial disputes. However the biggest worry hereabouts is the high voltage power lines – three sets – which cross the area; from time to time we’ve had to deal both with fatalities and some pretty nasty injuries. 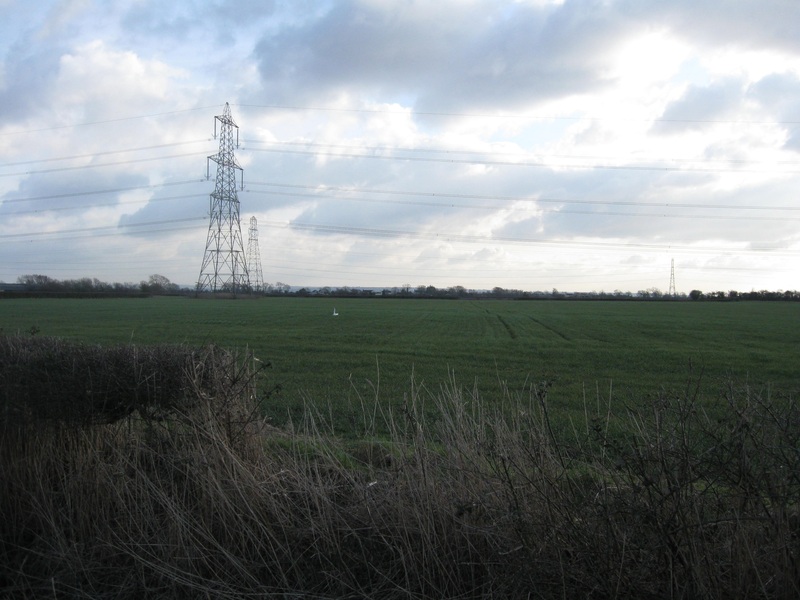 So it was that a call on Monday (2/2) afternoon set the alarm bells ringing – juvenile reported to have been in the same location for a number of days in a field which also contains a massive pylon (technically, I think the professionals call them towers), supporting a set of these high voltage conductors. With a variety of other pressing commitments, I’m afraid the best we were able to do was to visit the following afternoon – and what a relief, the weather could hardly have been better! It has to be said, you really do have to know your way around the levels in some detail to be sure of finding a way to the exact spot where the action is. The problem is the miles and miles of drainage channels, provided with very few crossing places, and not necessarily in locations making it possible to access the right field. Thus, setting out on this expedition had to be seen, possibly, as a mere reconnaissance. In the event, luck, as opposed to fine judgement resulted in a route to the field being found without too much difficulty. As the terrain is completely flat, and the hedges are a bit ‘sketchy’, especially at this time of year, it is certain the swan spotted our approach very early on, and therefore was on high alert. And he had plenty of time to think about it because the route involved a couple of zigzags in front of him. The final approach from the field edge took advantage, as far as possible, of tractor wheel marks in order not to damage the emerging crop.. It wasn’t too long before the swan decided ‘enough was enough’, and stood up and walked a little, thus, in a stroke, almost entirely removing the possibility that he might have hit the power lines and be badly hurt. In order to reduce to a minimum the possibility he might take off and fly into the conductors, it was important to get between him and the danger. Long before this manoeuvre had been completed he decided it was time to go! He took off towards the north, calling the while, and landed some 300 metres away in the field I had crossed earlier. Inevitably, the return route passed quite a bit closer to the cygnet than we currently were; it was obvious the swan was now extremely wary, but he did manage to stay put, and was still in the same place when we eventually lost sight of him returning to the car. 1. 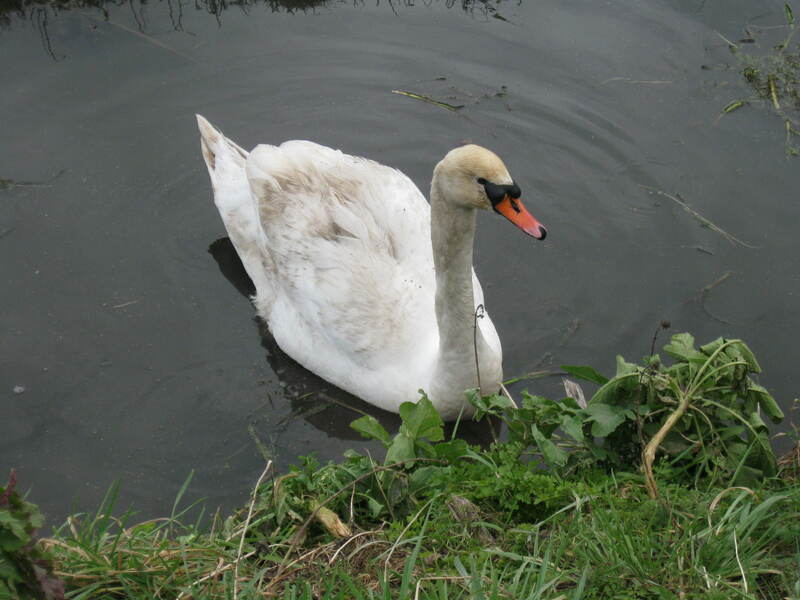 The northern boundary of the field in which our swan was now located comprises a deep and wide drainage ditch – reen. In the far distance, maybe 400m away were four more juvenile swans – probably siblings of the one whose peace we had just disturbed! 2. Exactly three weeks earlier, we had been called to Barecroft Common because a pair of swans were sitting in the middle of the track which is Blackwall. We did attend, but before they could be caught, they had moved, albeit a bit reluctantly, it seemed, back into the reen. 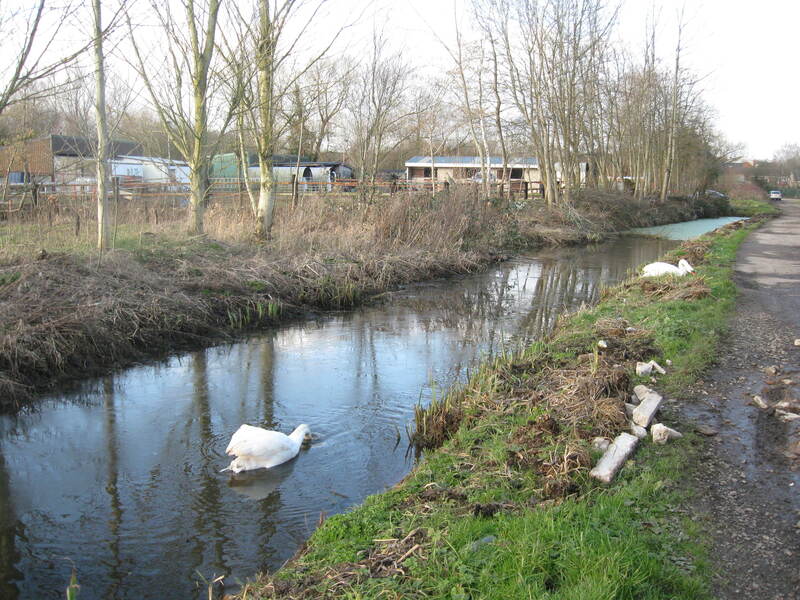 What appeared to have happened was that a territorial dispute had broken out – a short walk down Blackwall revealed the probable source of the problem – another pair of swans mooching up a short side channel. There was nothing could be done on this occasion, apart from hoping they kept out of each other’s way. The female of the pair on the track was very distinctive with quite a lot of her tail feathers missing. …and there she was, with her mate a little further up, but out of the water, grazing. …and, thank goodness, no sign of the other pair, but as we have commented so many times over the years, we really have no idea how many swans there on the levels; the only practical way of finding out would be by aerial survey by helicopter. Any offers? On one of our recent journeys up the M4 to Shepperton with a greylag goose suffering a bad eye infection and two young cygnets which needed to be in care for a while, we received an urgent call for help (this often happens when we are miles from home but this time it was certainly too far to turn back). It was to tell us one of the cygnets on Cwmbran boating lake (one of the family originally from the ponds at Llantarnam) was entangled in fishing line with one end coming from his beak. This was a problem which couldn’t wait till we arrived home later in the afternoon – it needed urgent attention as the swan had already separated himself from the rest of his family and was showing no interest in food. So we rang our stalwart helpers, Dorothy and Brian and passed the details to them. Thankfully, they were able to leave immediately. In Dorothy’s words: ‘following this call for help, we put lunch on hold and hurried the six miles to Cwmbran and to the lake. Very quickly we found one cygnet which was obviously fine so we continued our search around the rest of the lake and soon noticed another one tucked in quite near to the water’s edge. Unfortunately there was a long stretch of rushes and undergrowth between him and us so trying to reach him was impossible. We tried to tempt him with some bread to move closer but it was no good – he was not interested. We became concerned the fishing line he was entangled in was also caught in the undergrowth and was the cause of him not moving. At that time it was not an easy situation. Nearby to where the cygnet was were several men with radio controlled boats. We watched them for a while then Brian asked one of them if he could help by manoeuvring his craft ‘The Liverpool Pilot’ gently towards the cygnet in the hope it would not only show he was not caught up in the reeds but also to try to get him closer to the bank for us to catch him. The cygnet started to move and gradually came towards the bank which was a relief as it meant he was not tangled in the reeds. 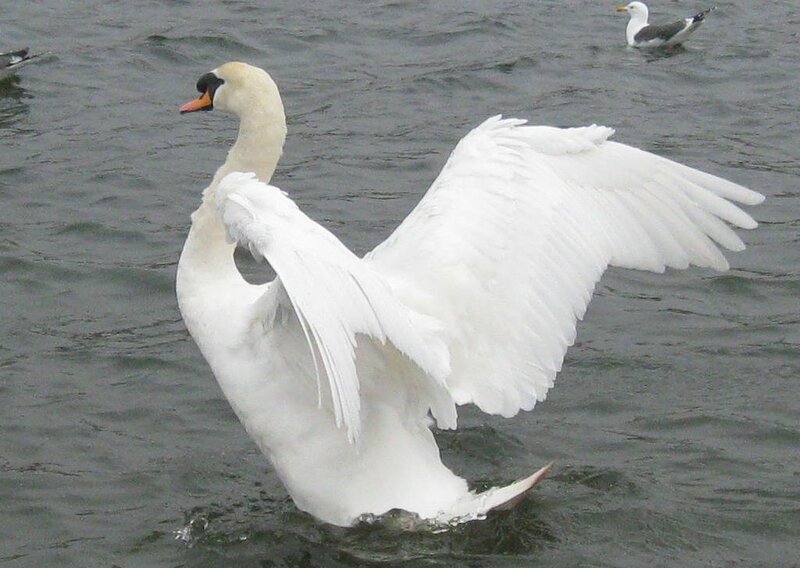 Then, as happens with swans, when you think you are winning he decided to turn away and move further out in the water. He was able to manoeuvre easier and more quickly than the Liverpool Pilot but having the boat there to keep him moving was a great help and as far as we know, this technique had never been tried before. But then he started moving to the other side of the lake. I followed him but he must have got fed up with being pursued and decided to fly/skim across the water to the far side where he landed and walked up the side of the bank. I was able to get between him and the water and catch him. When Brian got to us I had to untangle myself first as the line was around my legs and then Brian helped to unravel the line from around the cygnet which was around his leg and several times around one wing (approx. 3-4 metres) also steel traces hanging from his beak’. Brian and Dorothy told us afterwards, as it turned out, it was really quite an easy rescue but without the help of the man and his radio controlled boat it would have been a different story. It was Saturday and we were busy dealing with the aftermath of the three last remaining cygnets (juveniles) of two local swan families which had been under pressure from Dad to ‘leave home’. 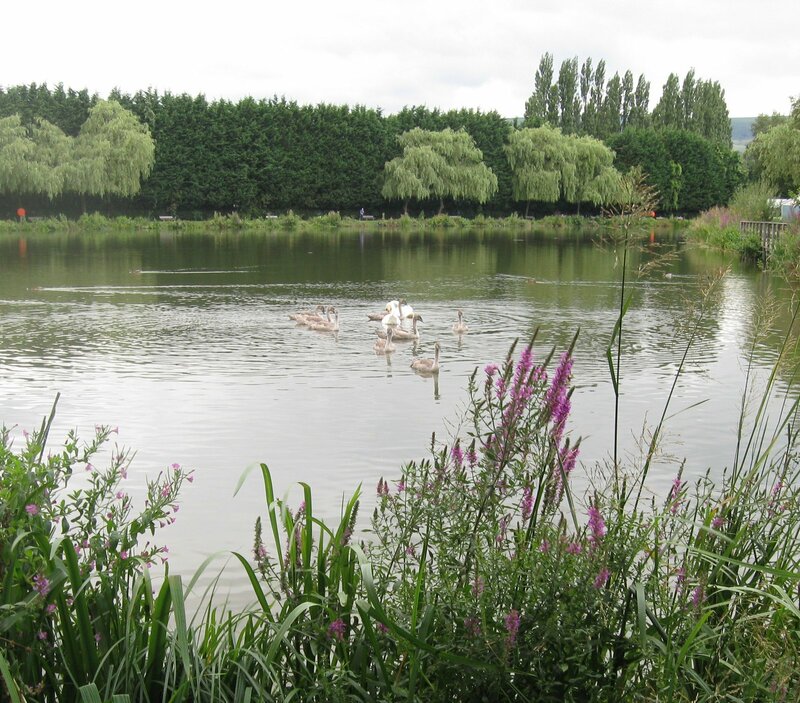 We had been to Cwmbran Boating Lake, the pond at Llantarnam and Atlantic Wharf (for us, a very familiar place) in Cardiff when another call came in from someone (Oliver) visiting Llangorse Lake near Brecon. 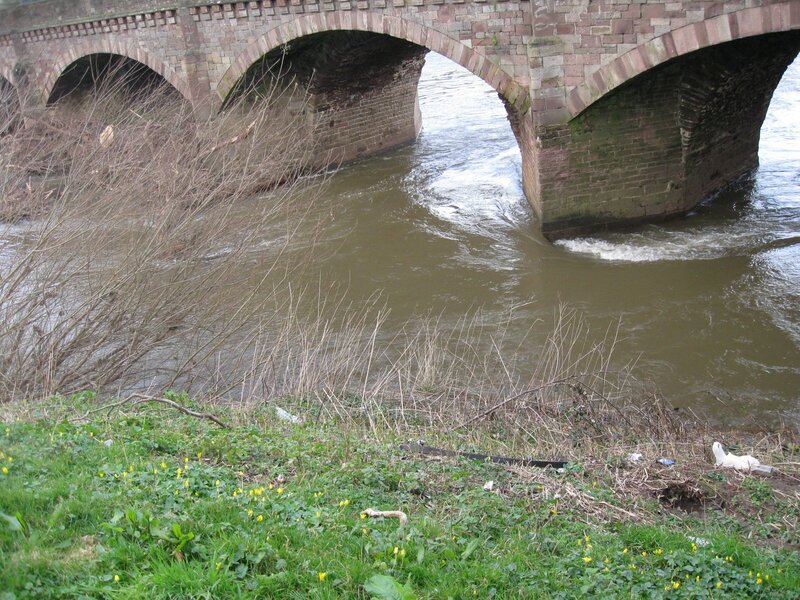 The news he had was serious – it was another angling related problem. 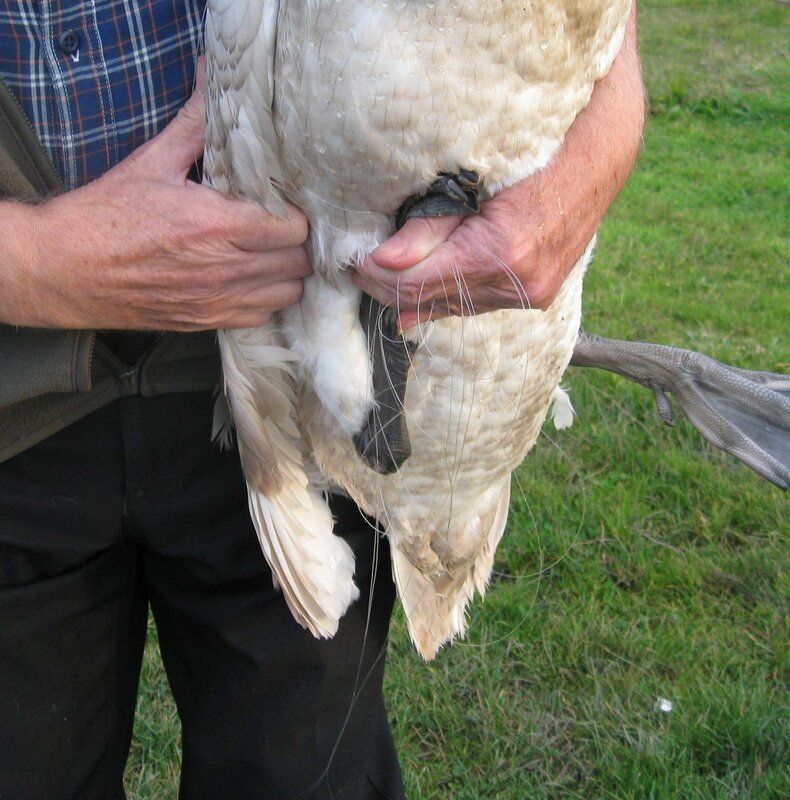 He had seen an adult swan which had become seriously handicapped as a result of the three pronged barbed hooks each end of a 6 inch pike lure of which one end had become embedded in the ‘knee’ joint (hock) and the other end in the underside of the web on the left foot. By this time it was quite late in the afternoon and there was no way we could reach Llangorse Lake before nightfall but we were fortunate one of our helpers, Martin, who lives in Brecon and who happened to be off-duty that day from his job as an ambulance driver, was able to check it out for us. He went to the lake but was unable to find the swan mainly because with the fading light, almost all the swans had retreated onto the water for the night. As Martin was scheduled to work for the next three days and this was a situation which required urgent attention, it could not wait until his next day off, so it was important we go first thing the following day. 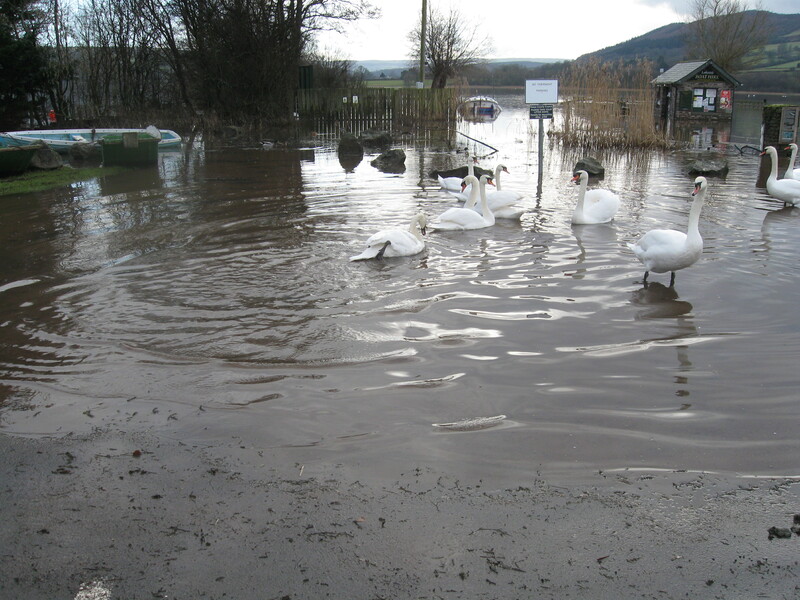 When we arrived we found about a dozen swans feeding on a partly submerged parking area where someone had provided a good quantity of grain. We looked at each swan individually and they were all fine, some had the metal BTO rings on but no Darvic identity rings. 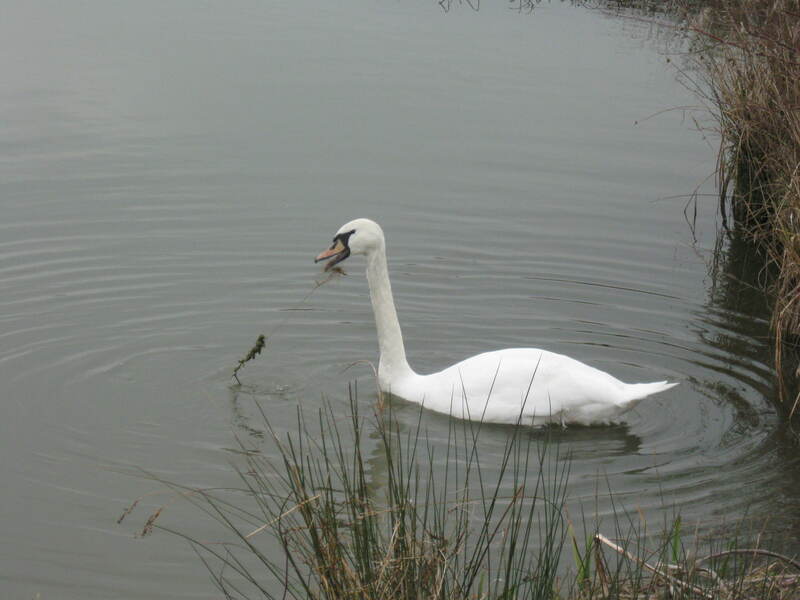 As we checked each one with binoculars one swan in particular caught our attention – she was swimming/floating very slowly and carefully towards the grain and as she laboriously tried to struggle to stand Peter went behind her and picked her up. The pain that swan must have been suffering has to be almost indescribable. 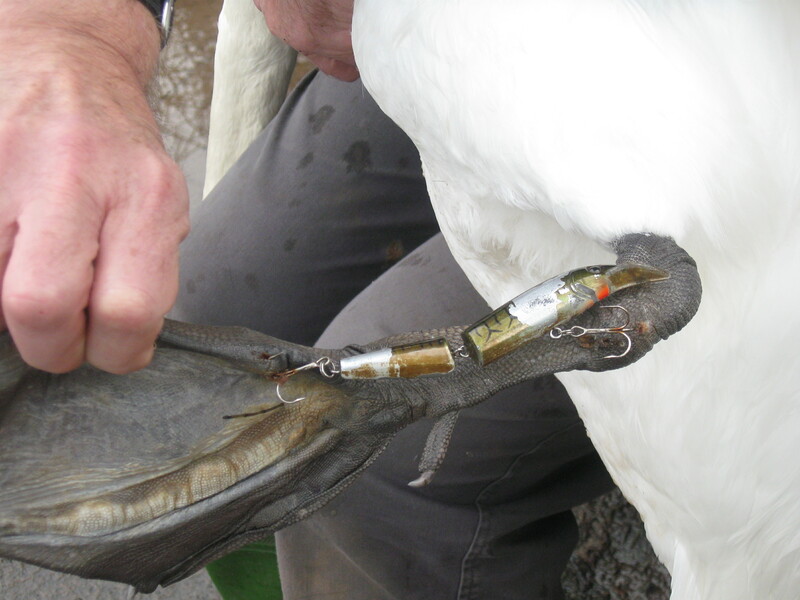 For us to be able to remove that instrument of torture from the swan’s leg we needed to stabilise her so we carefully strapped her in one of our wraps leaving the leg we needed to work on hanging loose. With the toolbox open, we carefully selected the strongest pair of cutters from amongst our substantial collection, and as gently as possibly cut through the hook just above the barb. With the lure free from the leg we were able to remove the remaining bits embedded in the leg before finally plastering the wounds with an antiseptic. We wish we could say she was grateful to be free of that awful encumbrance although she was certainly glad to be out of the wrap and able to join the other swans and hopefully her mate back on the water.